The reforms, expected to be introduced at Wednesday's City Council meeting, would allow developers to benefit from transit-oriented development incentives if they build within 1,360 feet of a transit station, up from the 600 feet allowed now. Along pedestrian-designated streets, which are streets with high concentrations of retail stores, the zones would expand to 2,640 feet, up from 1,200 feet. Residential developers in those expanded zones would not be required to provide any off-street parking spaces if they provide one bike parking spot for each unit in the building, plus offer either a bike rental station or car-share station on site. If a developer can't provide a station, it would need to provide a financial contribution to a bike-sharing station nearby. If you haven't had your fill of zoning rewrites with DC's, you can now get involved in Prince George's County's rewrite. Via RPUS, they're holding listening sessions on it this week starting tonight in Riverdale. The only places in the current Zoning Ordinance that include bicycle parking standards are the UC zones established in Subtitle 27A. They include bicycle parking standards that are comparable to standards found in modern codes used in other urban and town-center contexts. The standards are based on the number of vehicle parking spaces required on the site,84 and specify where the bicycle parking should be located, and limit wheel-based racks (where bicycles are affixed to a rack only by their wheel and not their frame) from counting toward the minimum number. To modernize the parking and loading and bicycle parking standards to implement Plan 2035, we suggest the following changes be made to the current regulations. All other areas in the County. Second, review and modify the current parking standards in these three areas to bring them into conformance with current best practices. In the Regional Transit Districts (including the Downtowns), establish requirements both for bicycle parking on-site (especially in parking structures or adjacent to building entrances, and to include covered and secured facilities for long-term bicycle parking intended for transit commuters or all-day employees of uses in the center) as well as in public right-of-way as part of a streetscape, with the latter to be located in places convenient to principal building entrances. 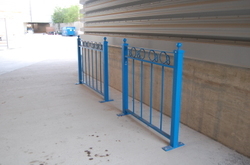 In the Local Transit Centers, Neighborhood Centers, Town Centers, and Campus Centers establish requirements for bicycle parking on-site as well as in public right-of-way as part of a streetscape. Eighth, encourage and incentivize the use of bicycle parking in other locations by establishing basic requirements for retail establishments of a certain size, office zones that permit a certain amount of intensity, and for any office, retail, multi-family residential, community facility or hotel use located on streets designated as bicycle corridors in an official bicycle facility master plan adopted by Prince George’s County; these requirements should also specify acceptable types of bicycle storage. A new set of basic street design standards to apply in zones associated with Regional Transit Districts and Local Transit Centers. To complement the mixed-use, urban, and transit-supportive character of development in these areas, the standards emphasize local vehicular circulation, pedestrian activity, on-street parking, street and bicycle network and connectivity, and access management. The concept of complete streets will also be explored in these areas. The regulations will also provide developers significant flexibility to propose alternative mobility and connectivity plans that demonstrate equivalent compliance. As well as other ideas that would make cycling better, like encouraging roundabout intersections and a grid network; limiting culs-de-sac and requiring pedestrian access to other local streets or pedestrian systems access when they're allowed; traffic calming; creating incentives for the provision of bicycle facilities. If you want to see better biking in PG County, better zoning regulations are a key step towards that end. Meetings are being held the next three nights. If you have not weighed in on the zoning rewrite and it's many impacts on bike parking and required showers in building, you still have more opporunities as the city is hosting its eleventybillionth open house meeting on it. Two more open houses are still on the agenda this month. The draft proposed text of the revisions can be found online at http://www.dcoz.dc.gov/ZRR/ZRR.shtmhttp://www.dcoz.dc.gov/ZRR/ZRR.shtm. Copies will also be available at the OP Open Houses. Additional information is available at the following websites: OP http://dczoningupdate.org/ http://dczoningupdate.org/orhttp://zoningdc.org/ http://zoningdc.org/ and Office of Zoning http://www.dcoz.dc.gov/ZRR/ZRR.shtmhttp://www.dcoz.dc.gov/ZRR/ZRR.shtm. The City Paper's answers issue has a question about bike parking at a condo. The board decided to ban bike parking from the garage and put in a bike room. But there isn't enough space for all the building's bikes and so the question is can the building do this. City Paper's Ally Schweitzer says yes. In short, the 2007 bike parking law required residential building owners to "provide secure bicycle parking spaces for all existing residential buildings with 8 or more units." The 2010 amendment to that law obligated the Mayor to define how many spaces that should be. In 2012, DDOT did that and made a rule that they need to have 1 space for every 3 units. [This is the same as the zoning update that I don't think has passed yet, plus another short term parking space for every 20 units]. So the question is, what is the ratio of spaces in the bike room to units in the building? I thought the zoning regs also made it illegal to charge for bike parking and had a rule about when the parking was inadequate the building had to provide more. But, maybe that got cut before the end. Anyway, it may be that the bike room is not in compliance either. The room has to have racks, a secruity light and a window on the door (so that people can see in before entering and getting jumped) and provide a certain amount of space per bike. I'm betting they didn't do that. GGW reports on the upcoming zoning hearings. Tuesday, November 12 on car and bike parking, the most talked-about part of the update. This hearing is actually full, but there is an overflow night on Tuesday, November 19 where you can speak. Even if you don't speak, I predict a high level of entertaining crazy. But from a policy standpoint, this is the once a generation change that will do a great deal to improve bike parking and commuting in DC. The most common excuse I hear for not bike commuting is lack of a shower, among other things this will require more showers and changing rooms for bike commuters. The zoning regulations will be discussed on Tuesday, November 12, 2013 at 6:00 p.m. – Subtitle C (General Procedures, including parking, bike parking, loading) . In response to these gaps/deficiencies, OP (assisted by its consultant, Nelson\Nygaard) proposed more robust standards as part of the Zoning Regulations Review (ZRR). Initial recommendations were published in OP reports developed through the ZRR Parking Working Group in 2008, and were subsequently refined and published as draft regulations to be adopted as part of the new zoning code. The Zoning Commission took “final action” on the proposed bike parking regulations (published as Title 11, Subtitle B, Chapter 16) on April 25, 2011, in ZC Order 08-06-C. However, since the new zoning code is still a work in progress and many issues remain to be resolved, the order has not taken effect. In order to be fully effective, the adopted bike parking chapter will need some minor revisions as the new zoning code is completed. OP proposed one adjustment (to the requirement for residential uses) in an updated chapter that was included in a complete draft of the new code, delivered to the Zoning Commission in July 2013. In addition, OP has proposed a new provision to require mitigation for vehicle parking that is provided significantly in excess of the minimum parking requirement. If a project provides more than 150% of the required number of parking spaces, the developer must mitigate the impacts of that over-parking through Transportation Demand Management measures. Qualifying measures could include bike parking spaces in excess of the minimum number required, and the provision of new Capital Bikeshare stations on- or off-site. In a column in the Post, Harriet Tregoning and Terry Bellamy explained what the new proposed changes to the automobile parking minimums actually mean and how DC thinks it will help the city meet its goals. They briefly mention how bike sharing will make driving less necessary, but they didn't go into how the new zoning regulations will change bike parking. So, I will attempt to that. 1. More bike parking - the current regulations (CR) require far less bike parking than the new regulations (NR) will. CR require 1 long-term bike parking space for every 3 residential units, NR requires 1 space for every unit. 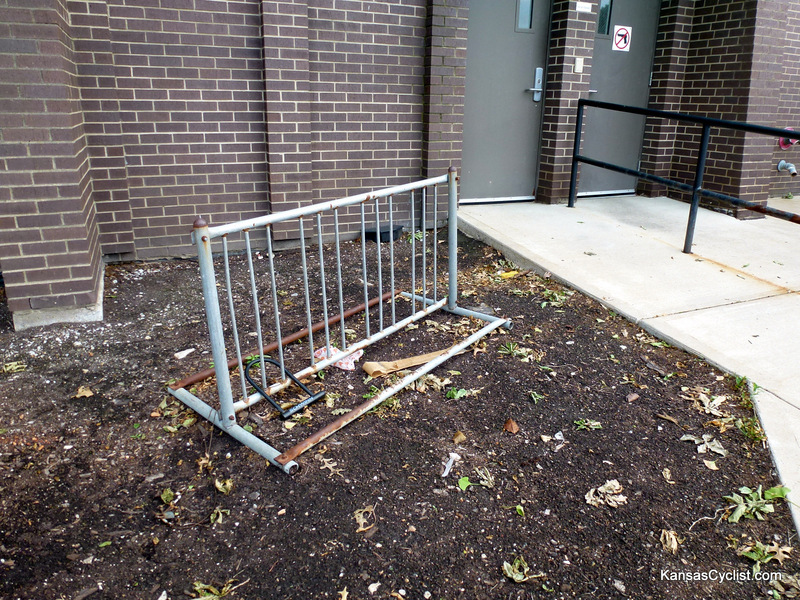 The CR requires 1 long-term space for every 10,000 square feet of gross floor area for every other use, but the NR requires long-term bike parking that is based on the type of use. That requirement can be as much as 4 times as large - for offices - or non existent for parks or parking lots. Long term bike parking requirements will go up for the following uses: chanceries, education, firearms usage, government and institutional. It will go down for the following uses: basic utilities; motor-vehicle related; production, distribution and repair; agriculture; antennas;parking; parks; and transportation infrastructure. Don't worry though, sexually-based business establishments will remain at 1 space for every 10,000 square feet of gross floor area. Short-term parking will also go up and is no longer called "Outdoor spaces" acknowledging that it can, in fact, be inside or covered. In most cases more short-term parking will be required. For education, short-term parking will increase by a factor of 5. In a few cases, like parking lots or transportation infrastructure, it will not be required at all. And in other cases it will remain the same. 2. Better parking - Under the NR, bike parking will have to allow a user to lock both the wheel and frame with one lock without removing a wheel. That means that bike racks like this won't cut it. The racks will have to be secured to the ground (not true now), give adequate space for access and allow for securing in two locations. Short term parking has to be located either on the same lot as the use they are intended to serve or on public space within 20 feet of the lot and within 50 feet of the entrance (no more DCUSA-style set-ups). Parking has to be on an all weather surface and visible from the building. This type of parking will fail at least three requirements. Long-term parking will have to be inside the building no more than one floor away from the ground level. They have to be available to residents, employees and other building occupants. There are new requirements for how bike rooms should be designed (with visibility from the door included) and that require long-term bike parking to be separated from auto parking by wheel stops. 3. Better maintained parking - under the NR, property owners are required to maintain their buildings parking and keep parking clear of snow, ice and debris. 4. Changing rooms - Unlike the CR, the NR has requirements for changing facilities. Non-residential buildings with over 25,000 square feet in gross floor area will provide 2 showers for every 25,000 square feet and 6 lockers for every 10 bike parking spaces. The NR lays out when buildings have to meet code (at construction or modification) with exceptions for historic properties. And it lays our guidance and a process for getting a waiver from these requirements. The movement of pedestrians, bikes and transit shall be prioritized, and provide reasonable accommodation for automobiles. The location of parking and loading access shall not unduly impact the movement of pedestrians and bicyclists. It's much improved over the current regulations. And it would be a shame to see it delayed or killed over parking minimums. In a story about coming changes to the way DC handles parking - one that notes that "the District charges $35 for a year-long residential parking permit while an annual Capital Bikeshare membership costs $75" - there is this added bit of good news. Those new zoning codes (Chapter 16) will require more and better bike parking as well as changing facilities in all new or upgraded buildings (depending on size). And they'll no longer tie the number of spaces to the number of car parking spaces, but rather to the size and purpose of the building. And, of course, one could argue that anything that makes owning a car more expensive, only makes riding a bike more competitive. I love this quote from John B. Townsend II of AAA who calls the new rules "discriminatory"
So, car owners are now a protected class? If he's worried about the poor, he should support higher gas taxes to pay for more buses and larger subsidies. According to a March 2010 study of bicycle parking at DC government properties, only 6% of DC government buildings would meet current bike parking requirements. 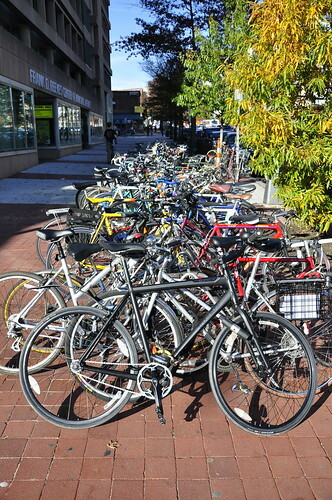 The study, which was mandated under the Bicycle Commuter and Parking Expansion Act of 2007 (the text of the act can be found in the report), found that the overwhelming majority of the District's 450 owned and leased properties would not meet current zoning regulations regarding bike parking - it they were required to meet them. While current zoning regulations require bike parking equal to 5% of automobile parking at commercial garages, no such requirement applies to office buildings owned and leased by the DC government. Not only would many of them not meet the 5% threshold, 81% of facilities have no bike parking at all. And many of the facilities that do have bike parking, have racks that don't meet current standards. DC is currently updating its zoning, and under the proposed regulations bike parking will be a function of the type of facility and its size in square feet. Under that standard, DC would need to add a total of 11,326 bike parking spaces. Of those 2802 would be class A spaces, intended for long-term use and 8526 would be class B, intended for short-term use. To meet this standard, the study estimates that the District would need to spend $1,326,000. Even where parking does meet the minimum standard there are locations where the minimum standard isn't meeting need. For example, I went to the Wilson Building earlier this spring and I had to lock my bike to a street sign that already had a bike locked to it - and I was lucky to find that space. The Wilson building might have a lot of bike parking - including indoor parking - but it still isn't enough. The District should commit to providing enough bike parking to meet the new zoning regulations and current need. The DC government should be an example to other employers, not a laggard. It is much easier to sell policies that the District has instituted itself. The report makes this same point, and lists other policies that DC should institute to be a model for bike commuting. These policies include transportation subsidies for cyclists, secure indoor storage, shower and changing rooms, workplace bike clubs, parking cash out, bike commuting classes, and free or cheap bikesharing memberships. At the very minimum, DC should offer its employees the Federal bike commuting benefit. The report also suggests that a follow-up study be performed on commercial buildings in the District. Such a study should probably wait until the zoning rewrite process is complete. In the meantime, the Bicycle Commuter and Parking Expansion Amendment Act of 2010 gave the 2007 act teeth. It requires that there be at least 1 bike parking spot for every 20 car parking spots (until the new zoning regulations come through) and it allows for enforcement of that standard. The fiscal impact statement that was issued with the 2010 law made it clear that there are adequate funds to enforce the law. If you should come across a commercial building in DC that doesn't provide the required amount of parking, you should contact the District's information line at 311 and report it. At this point the system relies almost exclusively on citizen reporting, so if you don't report it, it probably won't change.